iPhone users with the latest iOS 4.3.1 who were waiting for the release of the Jailbreak will breath a sigh of relief as the latest Pwnagetool is ready to Jailbreak your iPhone with iOS 4.3.1. To jailbreak all these devices the latest Pwnagetool has been released which allows your to break Apples shackles and Jailbreak your iPhone, iPod Touch and iPad devices. After you have downloaded all these and place them on your Desktop for easy and immediate access during the jailbreak procedure. After the Pwnagetool and all the other softwares have been successfully installed in your Mac you have to start this process. Where you can see your previously downloaded iOS bundle 4.3.1 now you have to click and select your required iOS. 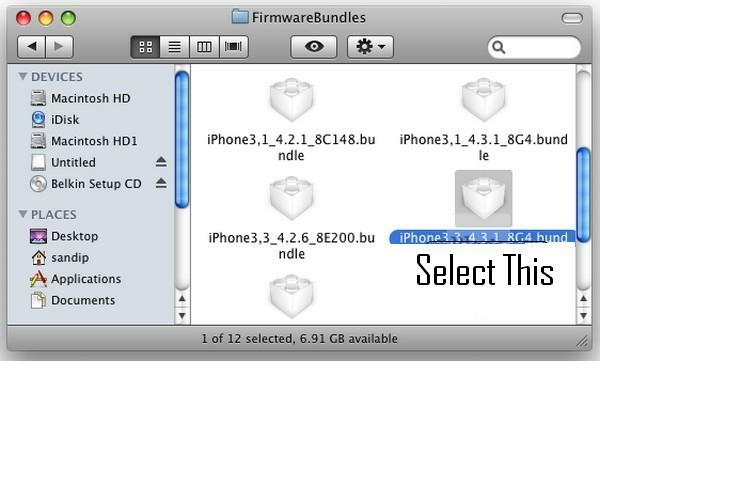 Now you have to copy PwnageTool Bundles of your iPhone 4.3.1 iOS and place it above the “FirmwareBundles“ folder and then close the first Window. 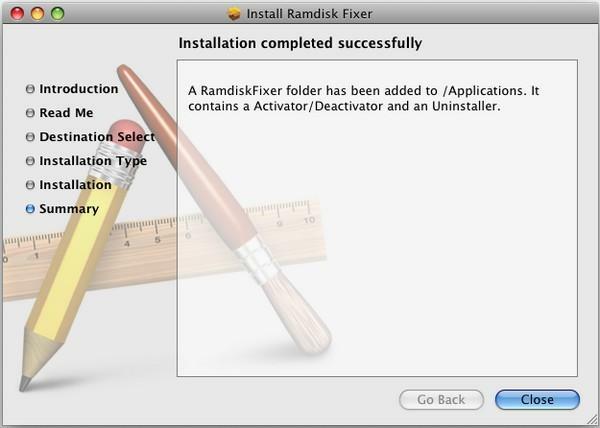 Next RamdiskFixer_v1.7.1 has to be opened Using the Ramdisk Fixer is easy as they have provided a step by step on screen instructions to be followed by the user which makes it very easy and you have to take care and comply with the readme file of ramdisk fixer. 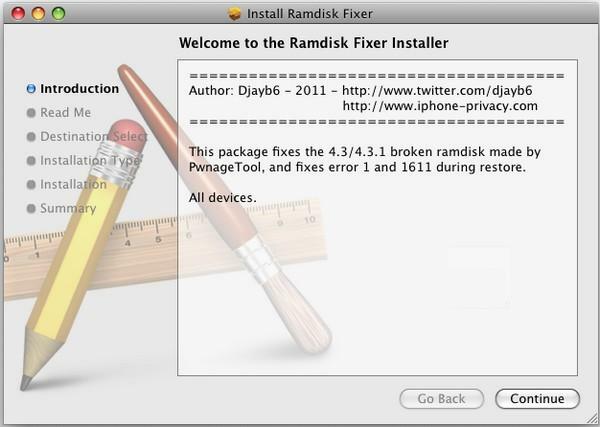 Ramdisk Fixer is used to fix the broken iOS 4.3.1 and fixes the error 1 and 1611 during restore. Installation Type- here we have to select between Activation orDeactivation. The last step here you have to launch the Pawnage tool which shows 3 devices Apple iPhone 3G, 3Gs and iPhone4 along with iPod Touch 2G, 3G, and 4G with the Apple iPad Tv as well. Now you have to select the Phone image as you are Jailbreaking your iPhone if you want to jailbreak iPod or Apple tv you have to click the respective icons. Then the Official Jailbreaking procedure takes place after you have selected the iPhone or iPod or Apple tv icons. After you have completed this step you have to install the IPSW iOS 4.3.1 software through Apple iTunes. To Install the modified iOS 4.3.1 to your Apple device you will have to do it through Apple iTunes. Connect your Apple device to your Mac or PC through its USB cable and open iTunes. If you want to save any important data like contacts you will have to backup your phone before a Restore. After following these instructions you will be having your instrument in DFU mode. Now press Option and click on update button on iTunes. 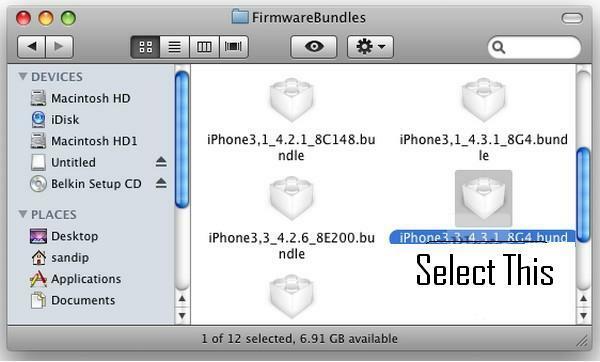 Now browse and select iOS 4.3.1 iPad custom firmware. We have to select Update which will lead to a window and we have to lead it to the custom IPSW we downloaded earlier. Let iTunes complete the firmware restore process. Once iTunes completes the restore process, your iPhone will be rebooted. Since this is tethered jailbreak every time you reboot your deice you need to connect to Mac and tethered boot using tethered boot utility. 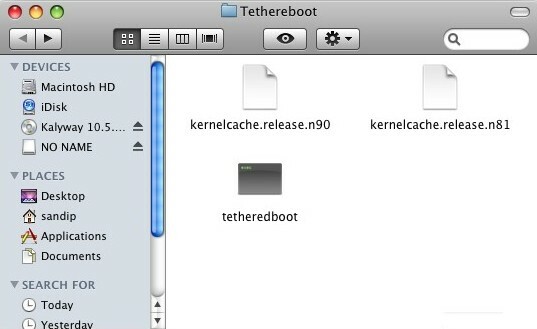 TetheredBoot Utility should be downloaded into the Tetheredboot folder on desktop. 4. Paste the these files inside Tethered boot utility folder as seen in the image below. Now you can enjoy with your newly jailbroken iPhone with iOS 4.3.1. All the above steps have to be repeated every time you reboot your iPhone. Never connect to iTunes and allow it to download and install the latest firmware which will remove your jailbreak. hi I am Hemal shah I just tried your jailbreak ios4.3 but it’s nt working,,my iPhone went to recovery mode..plzzz guide me..how to do it? ?